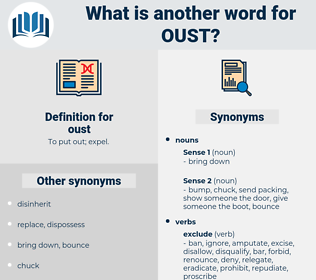 What is another word for oust? cutting off without a cent. 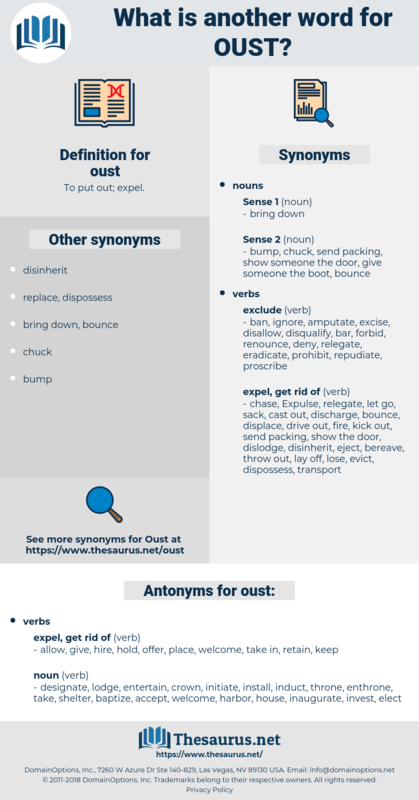 expel, supplant, remove, isolate, overturn, eject, displace, divest, evict, exclude, deport, banish, dispel, sack, insulate, replace, dislodge, deny, supersede. allow, give, hire, hold, offer, place, welcome, take in, retain, keep. entertain, induct, inaugurate, baptize, shelter, enthrone, initiate, invest, accept, lodge, harbor, elect, take, house, throne, designate, crown, install. Lady Laura came, as she had promised, and gave her dearest Clarissa lessons in the art of presiding over a large establishment, and did her utmost to oust Miss Granger from her position of authority in the giving out of stores and the ordering of grocery. They now, like the flowering plants on land, not only herald the new age, but rapidly oust the other fishes, except the unconquerable shark. replace, supersede, supplant, supervene upon.